Alright, this is my Easter dinner recap. Get ready! I mentioned on Friday that I was thinking of making deviled eggs, and so I did. I didn’t want to make a big batch, so I made just enough for Jesse and me to eat. I had never made deviled eggs before, but have looked at many recipes and eaten them before, so I knew the basic idea. These turned out great, and Jesse and I sat out on the patio in shorts and t-shirts while eating them. We also enjoyed some chardonnay in our new wine glasses that my aunt and cousin sent as a shower gift, and had some pleasant conversation. 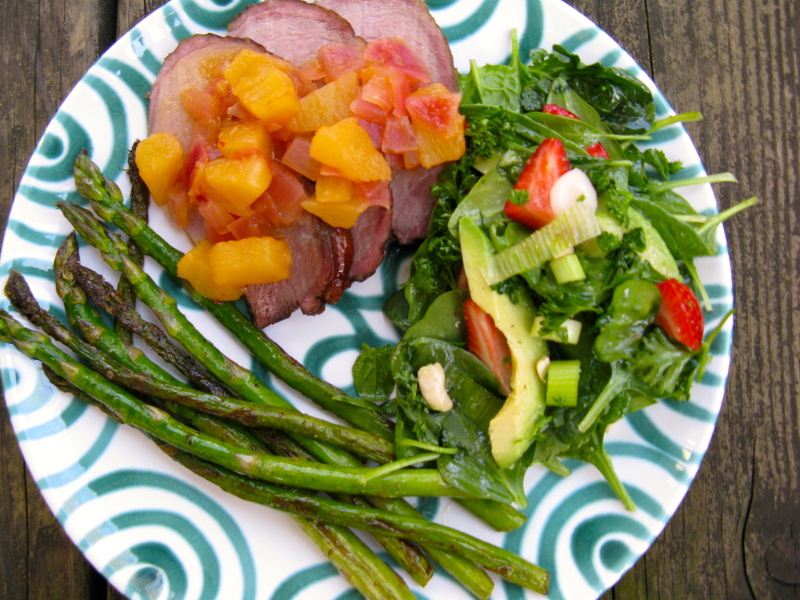 For dinner, we had a petite ham from US Wellness Meats with a homemade glaze, pineapple chutney, a spinach salad and cooked asparagus. We had a cake for dessert, which you’ll see my note about at the bottom of the post. Recipes are listed below. Slice eggs in half, lengthwise and carefully scoop the yolks out into a bowl. Mash the yolks with a fork and then add the remaining ingredients, except the paprika. Mix well and spoon into a small zip-lock baggie. Snip one of the corners from the baggie and pipe yolk mixture back into the egg cavity. Before serving, garnish with paprika, if using. Preheat oven to 350 degrees. Place ham in a foil-lined roasting pan and bake for 30 minutes. Meanwhile, whisk together the glaze ingredients. After 30 minutes, brush half the glaze on the ham. Roast for 10 minutes, then remove from oven and brush on the remaining glaze. Bake for another 10 minutes. The chutney was inspired by a Whole Foods recipe, but modified to my liking. It was a wonderful accompaniment to the ham and together, it was out of this world (and the glaze was not overpowering or super sweet). I hadn’t tasted ham probably since early high school and boy, was it good! I’d buy this US Wellness Meats ham again in a heartbeat! Compassionate-raised pasture ham is hard to come by, especially one that is both sugar-free and nitrate-free. This is a major win. Place all the ingredients in a medium-sized saucepan and bring to a simmer over medium heat. Continue to simmer for 10-20 minutes, until mixture has thickened. Remove cinnamon stick and serve warm atop of ham. The salad idea came together while grocery shopping for Easter dinner…on Easter Sunday. Ha, we never made it to the store on Saturday, like we usually do, so we had to go on actual Easter day. I expanded upon my salad idea as I assembled it at home, and the result was refreshing and summer-like. In a large bowl, mix together everything, but the dressing. Just before serving, mix in the dressing. If you really want to know what I did for the asparagus, I melted 2 Tbsp of grass-fed butter over medium heat. Then, I added a bundle of asparagus (woody ends removed) and seasoned with sea salt and pepper. I tossed the asparagus occasionally and allowed it to brown and caramelize a bit. Once tender, after 5-7 minutes, I removed from heat. We had a delicious chocolate cake for dessert that I will post about later in the week. I think there’s enough recipes here for one day! I had no idea there was such a thing as macadamia nut oil mayo! Yet another food item on my list of repulsions (mayo), this is actually intriguing… Maybe I’ll give this a try, slathered a top some bacon, with a side of banana :-). Seriously, it may be worth a try. You’d be surprised at how delicious it is! I think it’s like candy, and Jesse and I both love it. This is coming from someone who never liked mayo either, but when it’s homemade and made with mac nut oil, you can’t go wrong. If you like macadamia nuts, you will like the flavor.